First things first we had to empty our hotel room as we won’t be returning. The icing on the cake was when I was heading down in the lift with my bags, the lift slowed down, an alarm sounded, the life paused then fell. It suddenly stopped, then continued as if nothing was wrong. I exited the centre lift at Aloft and reported the issue. The only response I got from the woman on reception was “ok. We will look into it” And she carried on with her job. I sat down and watched as nobody checked the lift, no phone call was made and basically, the public continued to use the faulty death trap. I will not be returning to this hotel and recommend you don’t go there. 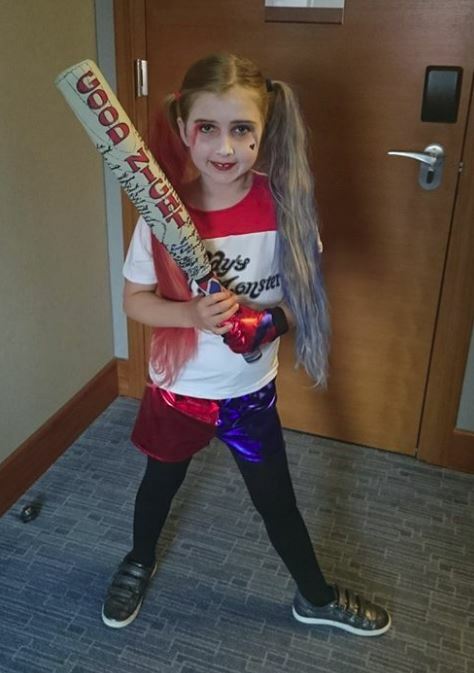 My 7-year-old was in her Harley Quinn costume (DC) and I got into my Iron Man MK1 (Marvel) Megan was looking very cute! This was the first time in my Iron Man cosplay that I got to try out my secret Masquerade weapon… The Flamethrowers. 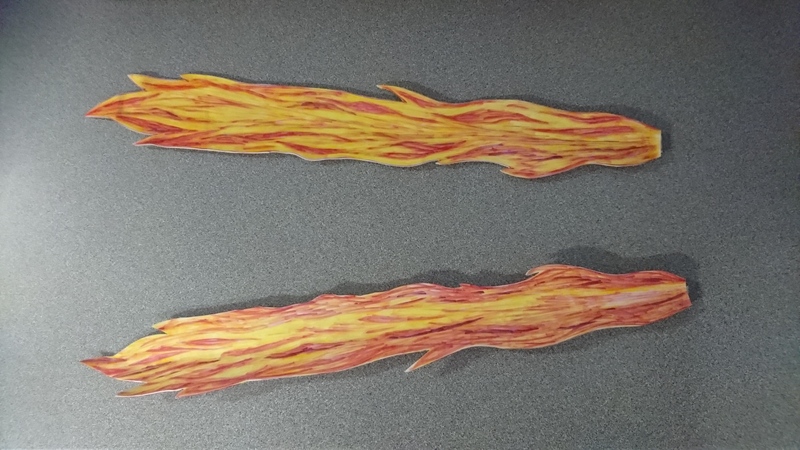 Due to rules and regulations, I was finding it hard to work out a way to give a flamethrower effect. As I was measuring something at home I realised that a tape measure could unravel and hold its self up. I cut about a meter of the tape and covered it in 2mm EVA foam. I coloured it in with some sharpie pens and there we have it, flames that unravel. All I had to do was hold the string and let go on cue. I instantly lost everyone as I could not walk as fast as everyone else. 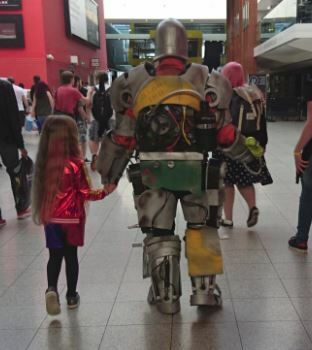 Luckily I found my father and we decided to go to the MCM Letters 1st before it got to busy. It felt good to finally get this costume to the MCM London. Last year I was in hospital very ill when he should have been walking these same floors. We left the letters and made our way to the Cosplay corner to get judged. I was noticing how hot I was getting within. Water, I needed lots of water today! The three judges had poker faces. I left them unsure of what they were thinking. It was time to get some pictures and walk about outside. But first Sneaky Zebra wanted to film my Iron Man. It has been a Cosplay dream to make the cut on a Sneaky Zebra Cosplay video. It was on my list of things to do at the MCM. I hope he makes the cut! *EDIT He made the cut at 03:03* Keep an eye out on their Youtube channel! I then headed outside. It was hot! I walked down to the trees but after getting into another Youtube video by Kopfkino and having the odd photo I just had to get back inside with the aircon! I stayed around S1 as the suit was heavy and I needed to drink water all the time. I had pretty much lost my Cosplay buddy Bluejam77 and my family were off enjoying the convention. But I was happy. 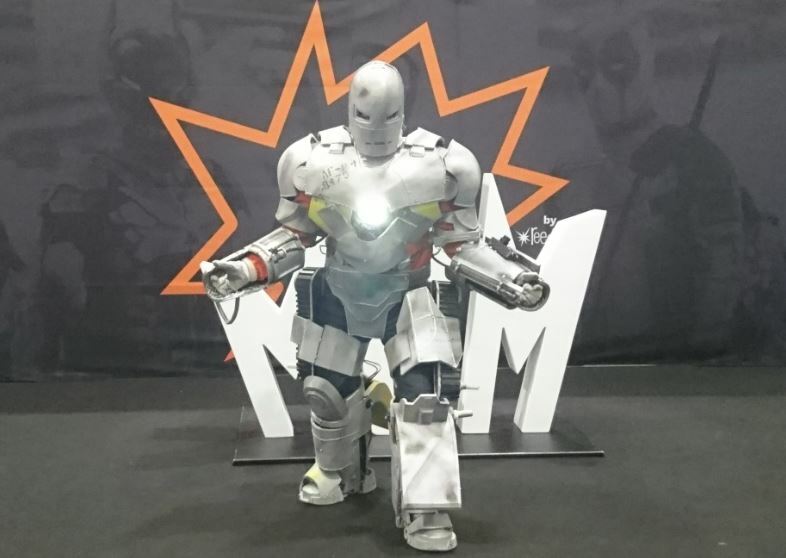 The dream of becoming Iron Man in his MK1 was now a reality. I was bombarded with photo requests and the time was flying toward the masquerade. Kaldorei Cosplay appeared dressed as Aloy from Horizon Zero Dawn. She had now decided that she will compete today in The International Cosplay League. Good luck!! A year and a half. It all started as part of Dom’s motorbike. Things had failed, things had worked. Finally, time to get on the MCM Main Stage, sponsored by Cineworld. 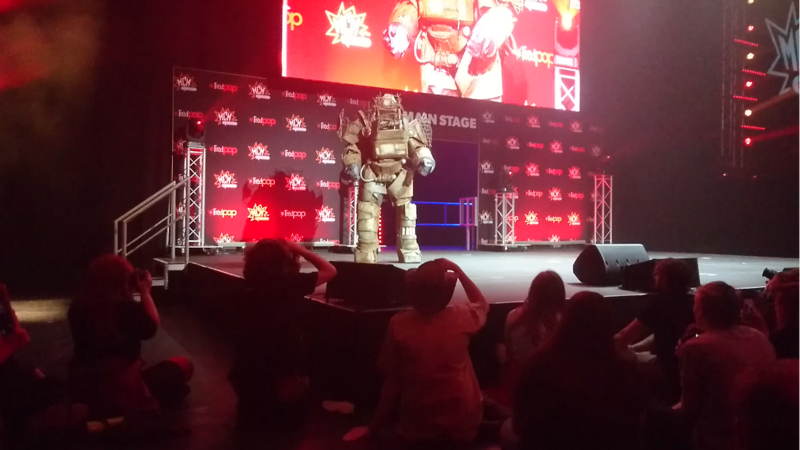 I was put into line and discovered Bluejam77 was behind me in his full-size Fallout 4 power armour. My father puts my rolled up flamethrowers into my hands and left. Problem! As I stated in previous blogs, I have been diagnosed with rheumatoid arthritis in my hands. 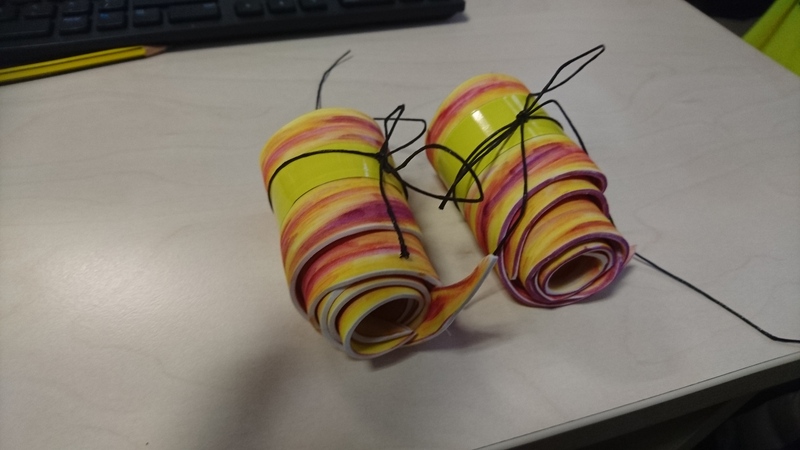 I had tested the flamethrowers by holding them in my hands rolled up for a few minutes. I was now holding them for 20 minutes and the pain was excruciating but I’m next! Just 1 more minute!! I left the stage knowing I had failed. The flamethrowers had worked but due to the pain in my hands, I had to flick the flames away on stage and shake my hand to unlock my fingers. As I did this the yellow cylinder on my left arm falls off my costume. In the cosplay world, if a part falls off your costume during the masquerade its an instant fail. I knew it was over for me but next up was my travelling buddy Bluejam77. He nails his walk on getting the 10-foot tall costume on and off stage without falling! As the Judges read out the winners It’s great to hear Bluejam77 getting called up as a runner-up in the masquerade! Then they call out the winner of The International Cosplay League. Another great win by Kaldorei Cosplay! She will be heading to Spain to represent the UK!! 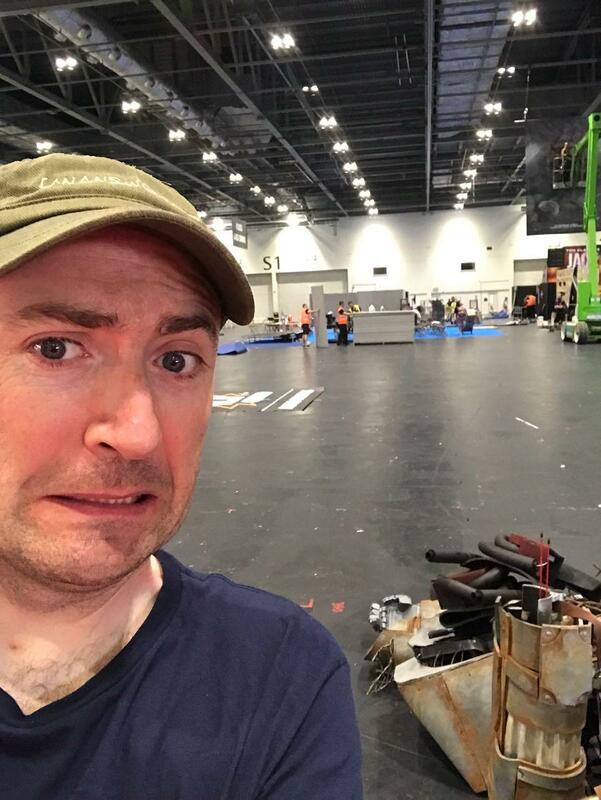 Bluejam77 had not thought about how he was going to get his cosplay out of the Excel as it began to close up. I left him talking to the media about his win, knowing I needed to get out of this costume. I had been wearing it for 8 hours! I headed to the hotel, I would then drive to the front of the Excel to pick up Bluejam77 and his monster of a costume. We then hit the London traffic and said goodbye to the mainland. This will be my last MCM for some time but not my last con! Keep an eye on my facebook page for updates. My next con will be in Hawaii! Where did we leave Bluejam77? 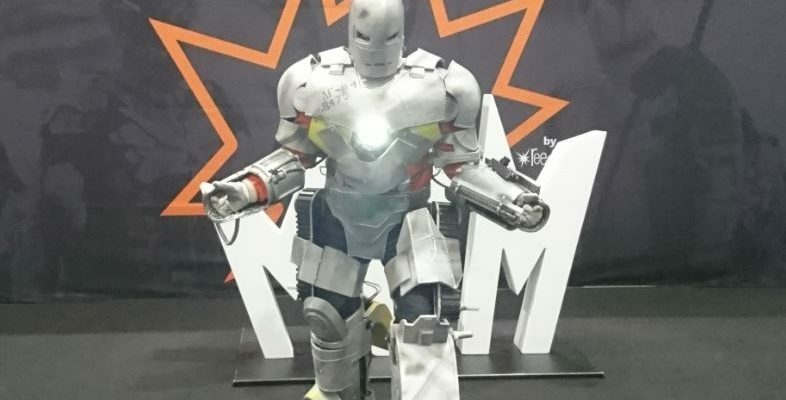 This entry was posted in CONVENTIONS, COSPLAYS and tagged Cosplay, irondaxman, Ironman, masquerade, mcmLDN18, ReedPop, Sneaky Zebra. Bookmark the permalink.